Email communication plays a pivotal role in today's industrial and business communications. Thousands of emails are sent and received in a mail domain. 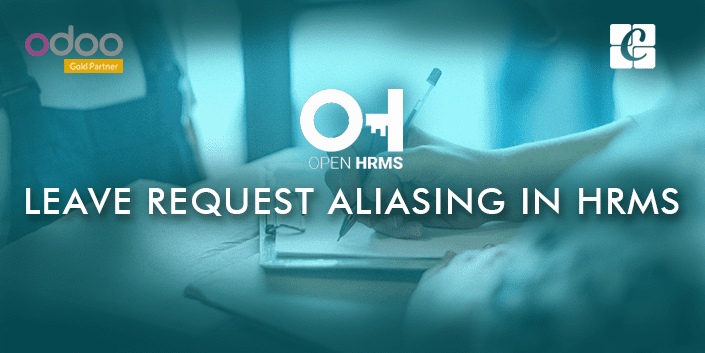 In Odoo ERP, Email aliasing feature already exists and it allows to fetch the contexts for several perspective automation. For example, the leads generated from incoming emails. This blog discusses the new feature regarding leave request automation from incoming emails. Why do we need to automate Leave Request Mails? Suppose, if a company has around 500 employees and at least 30-40 employees take leaves per day, these details should be recorded properly. In almost every big companies, there will be an authorized HR person to take care of the leave request and further processing. But the process is quite expensive as lot many resources are involved within. Now, think about automatic leave request creation in Odoo ERP from incoming emails with a specific context and email id. Here, an HR person has to only manipulate the leave records, he/she should not get involved with any kind of re-entering, saving time and money. We are introducing a good feature module - Recruitments posts can be done via Odoo and Open HRMS to create leave request automatically through incoming email. This module automates the leave request process via email. 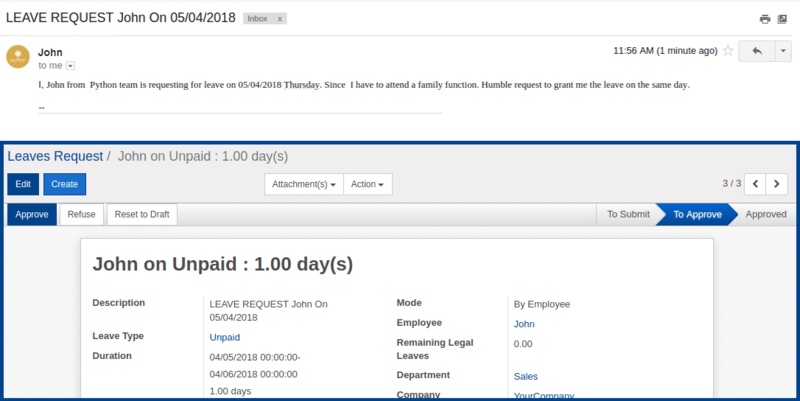 Here is an employee wants to send leave request via email, then this module will create those leave request in Odoo for corresponding employee. Firstly, do the necessary configuration for using the module. c. Select ‘Leaves’ in ‘Create a New Record’ field. Click on the button named ‘Fetch Now’ for fetching all emails into Odoo. 3. Set valid email-id for all employees. These are the basic configurations to automate a leave request creation. So every employee can request leave through their registered email id. Then the system will identify those leave request and make it as a leave request in odoo leave records. Then the HR can proceed with further processes. To ensure the module works in proper, you have to follow the below instructions while sending a leave request. Every employee will have a registered email-id in Odoo employee master. Please give subject to starting ‘LEAVE REQUEST ‘. Hence system can identify all the leave request from bulk emails. You can mention the leave dates in mail body with the desired format as “%d/%m/%Y”. Hope this article was useful! Good Luck! !